0 - Cut off the stem about a 1/4" from the bottom. 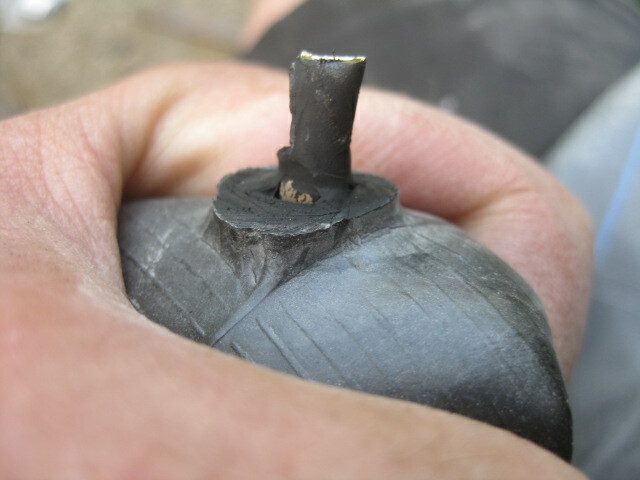 1 - This leaves a stub with the (now crushed) brass tube in the center. 2 - Slice around the base with knife close to the base (the easier the stem comes out the closer that it can be cut to the base). 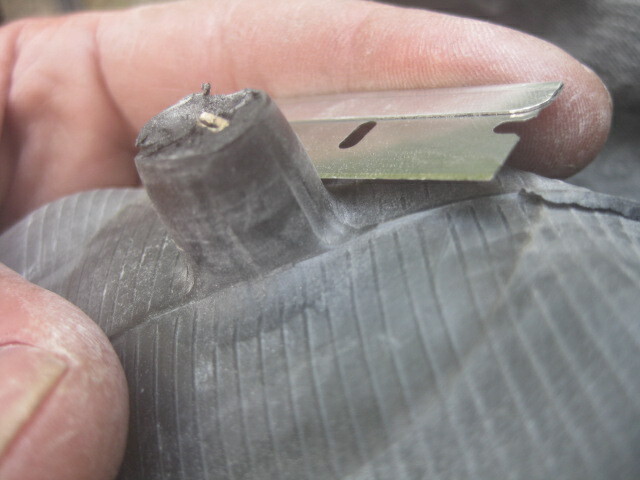 3 - Cut away the rubber. 4 - Brass tube is now left. 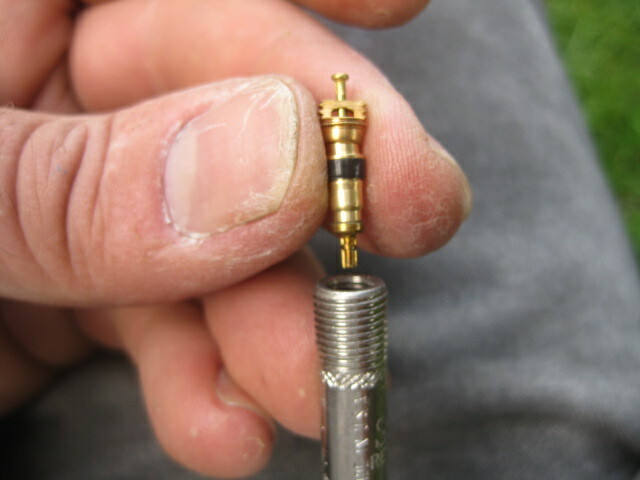 5 - Twist the brass tube out. 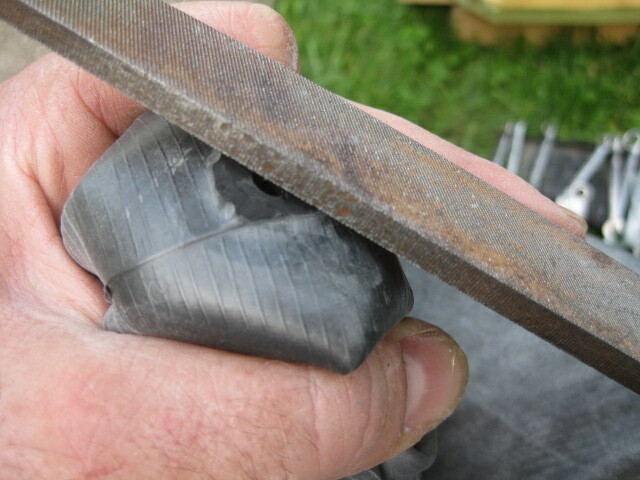 Cut around the edge if needed (see next step below), but the goal is to leave the inside of the hole as round and smooth as possible. 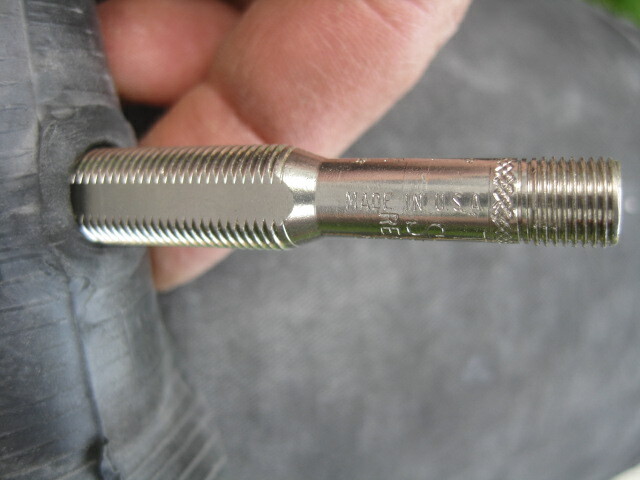 6 - If the brass stem is not easy to remove (which is probably a good thing if you were going to use the rubber stem instead of removing it) it will be necessary to cut it out somewhat so that the tube doesn't get a tear and get ruined. 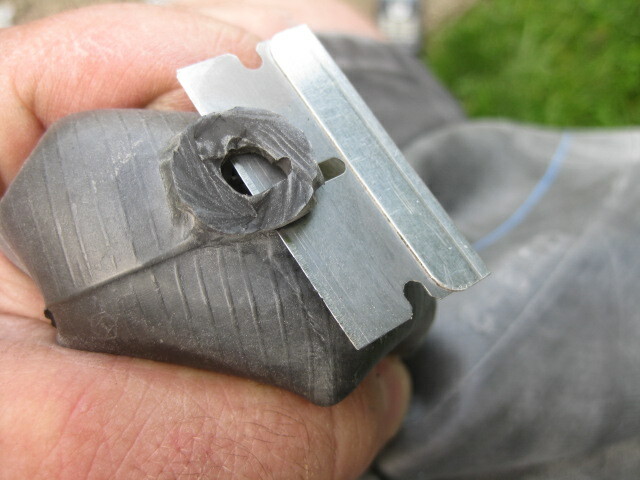 I've used a razor blade to do it, but it is hard to keep it round and this leaves places were it can tear. 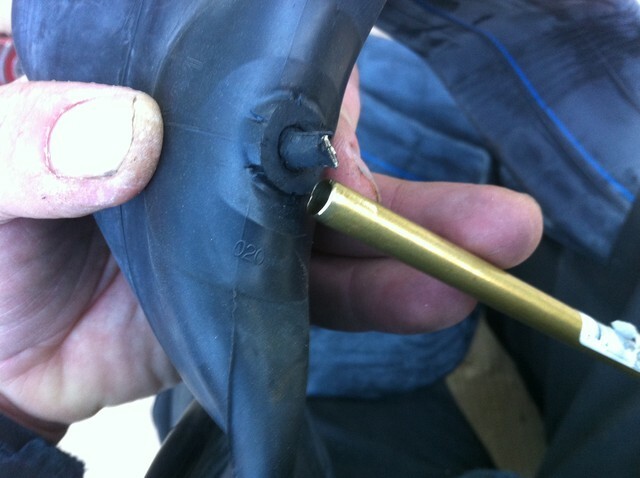 One way to do it is to use some thin brass tubing (5/16" dia) to cut around the stem. 6b - Notice how smoothly the cut is around the stem - this will help keep it from tearing when the new metal stem is installed and later when the tube is inflated. 7 - Trim close to the base. 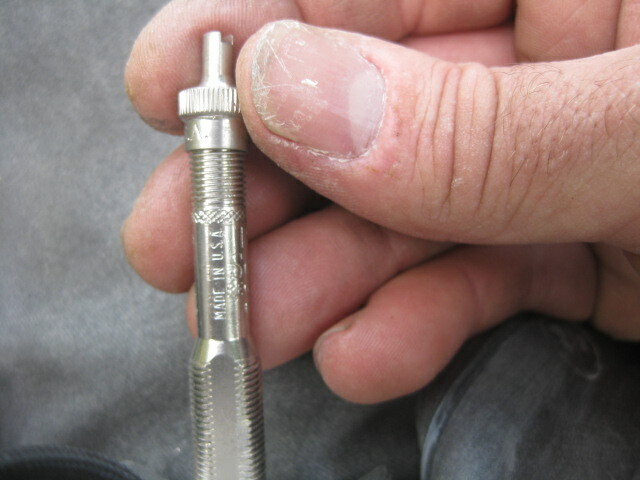 These multiple extra cutting steps are not necessary if the brass tubes are easy to remove and don't want to tear up the tube on the way out. 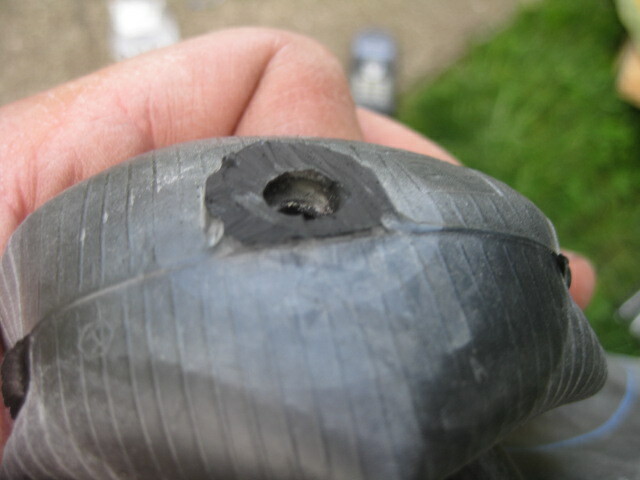 8 - Try to end up with something reasonably flat, close to the surface of the tube. 9 - Use a file or whatever you prefer to smooth it. 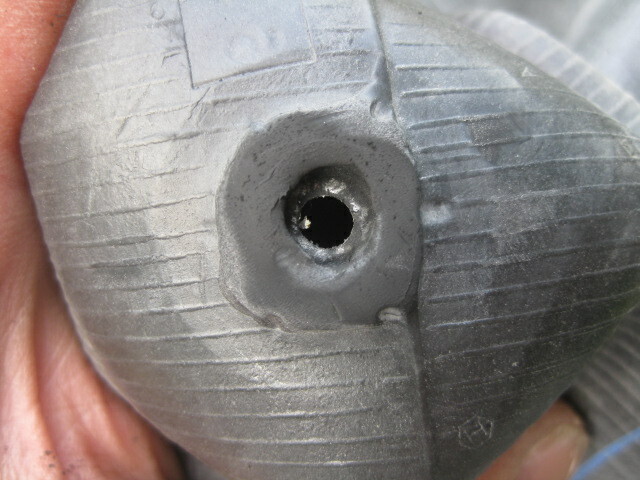 10 - The final result after filing it smooth. 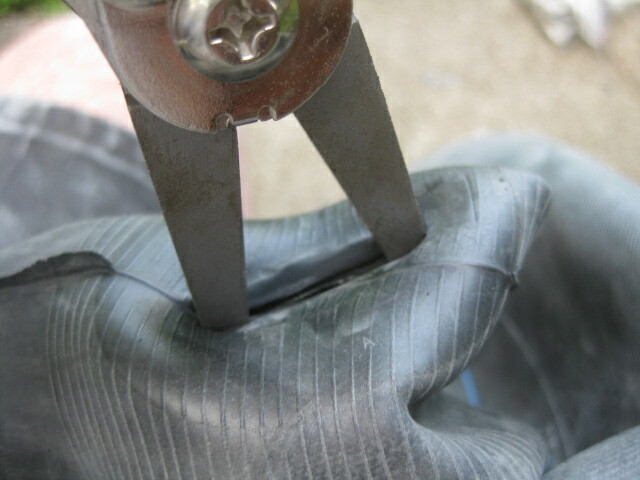 11 - I use snap ring pliers or just needle nose pliers to open up the hole. 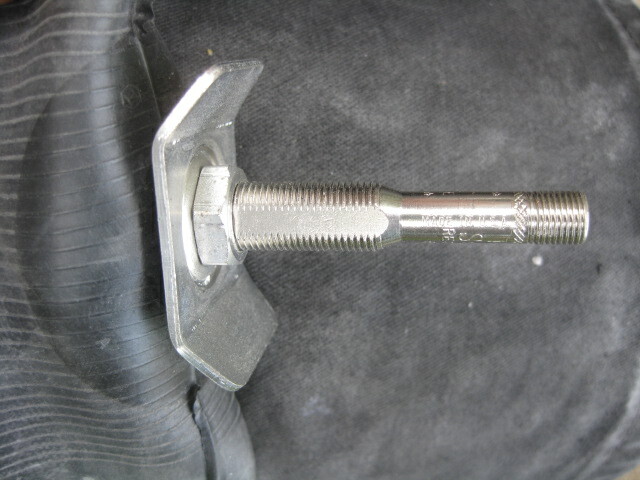 Others have used two hooks mounted in a vice to pull on either side of the hole to pull it open. 12 - Don't be afraid to stretch it open. 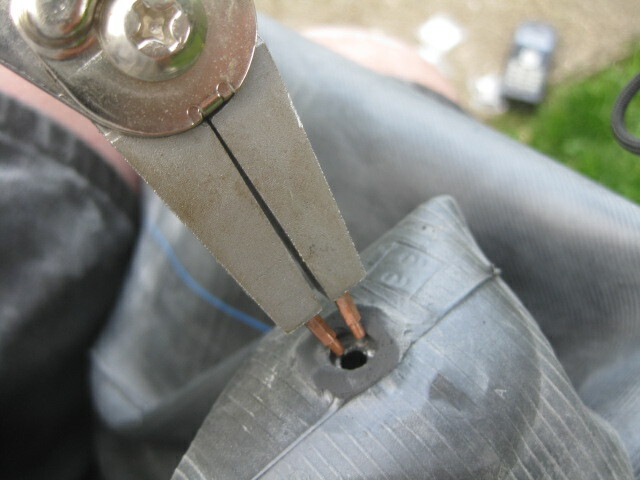 13 - These pliers open it up just enough to get the stem started in the hole. 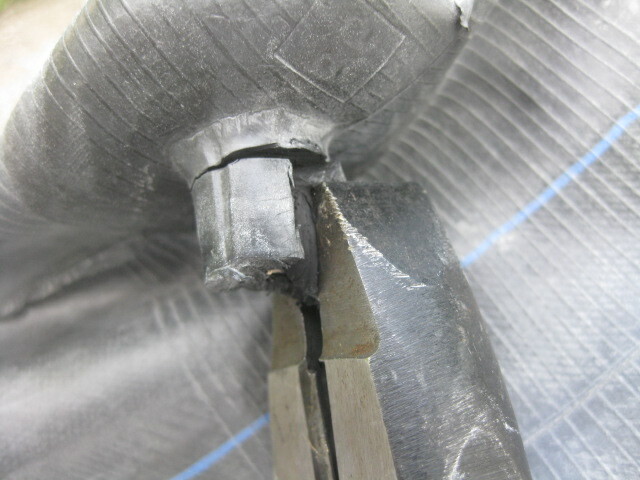 14 - Once the stem is in the hole the pliers can be removed to finish inserting the stem. 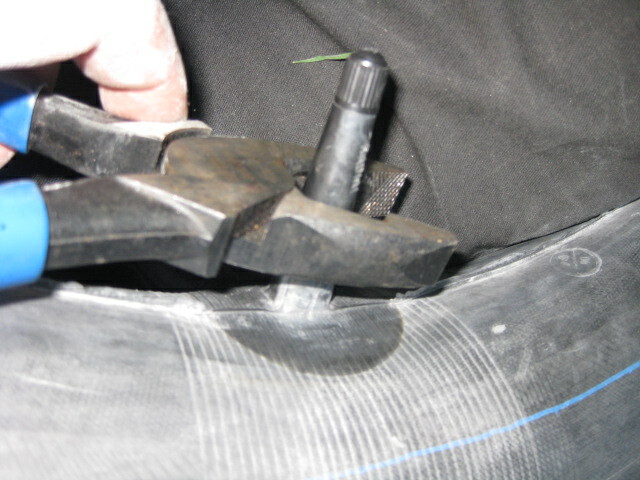 15 - The stem is in the hole and the tube is snugged up right against the stem. 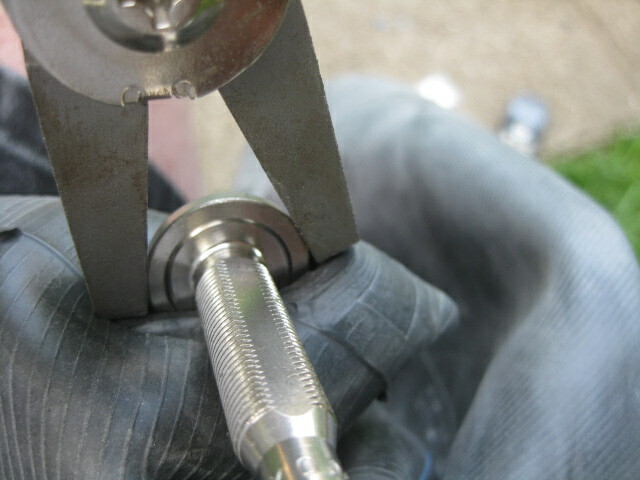 16 - Put on the bridge washer. 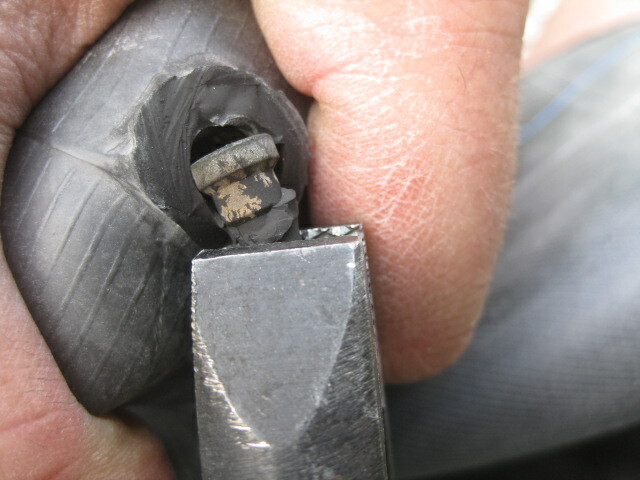 The ridges in the stem base and the bridge washer are enough to seal the air from coming out. 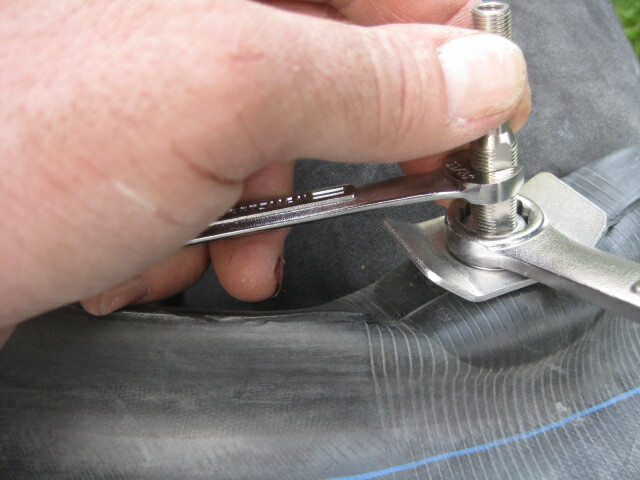 I don't use any sealant because I don't know what will be compatible with the rubber but the results have been fine reusing old stems on clincher tires which get inflated to 65 lbs/psi. 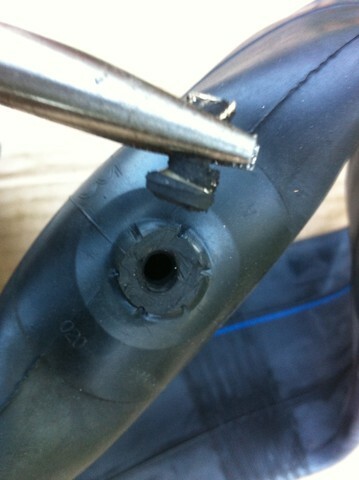 I have seen sealant on some old stems and might have used some bead sealer if I had some handy. 17 - Put on the nut. 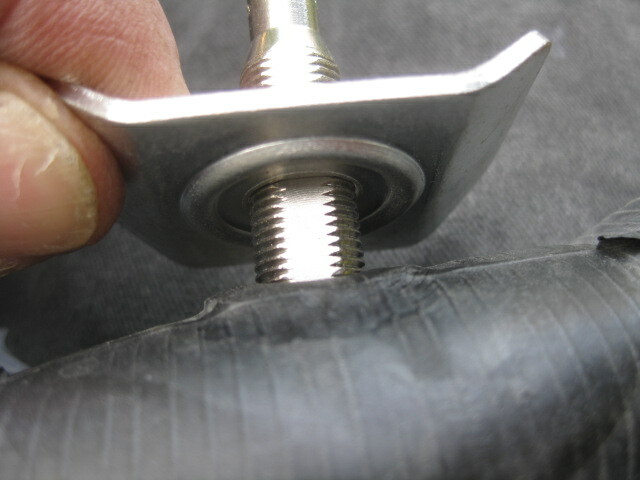 18 - Tighten down the nut. 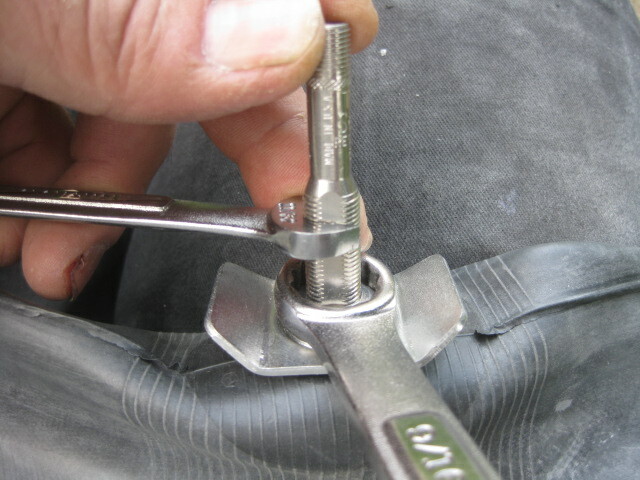 I've heard some people express concern about making it too tight and squeezing out the rubber from between the washer and the base but I don't see that happening when I get it good and tight by hand. 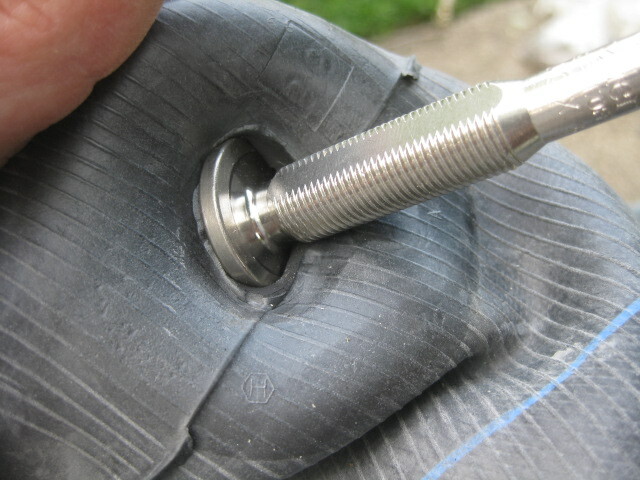 19 - Make sure the stem and washer stay in line with the tube and don't turn as they are tightened. 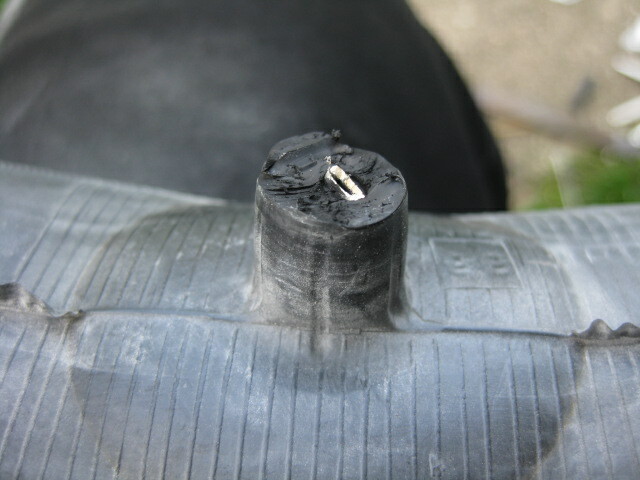 20 - Put in a new Schrader valve (particularly if using old stems). 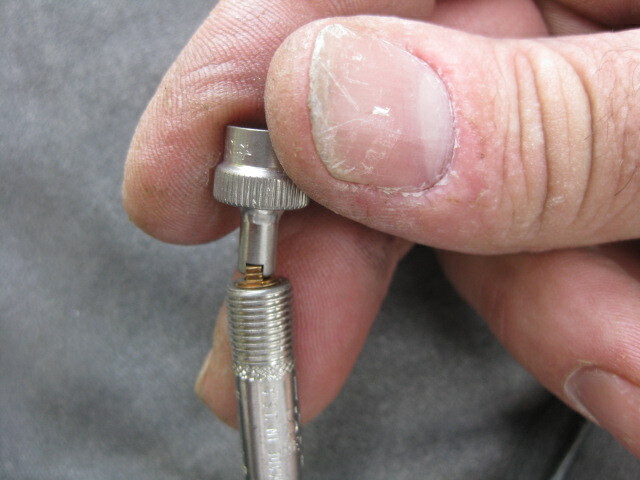 21 - Tighten the valve with the cap. 22 - Put the cap on - it is now ready to mount on the wheel. Questions or comments? Send mail to John Carter: cars @ sheepisland.com (remove the spaces).